Taking a new puppy to stay in a hotel for the first time is much the same as taking away a new baby. You have all the paraphernalia to pack into the car boot to start with – but also a certain amount of apprehension. Will his crying/barking bug the other hotel guests who’ve come away for a relaxing break? Will he sleep through the night without waking guests in the room next door? Can we get through dinner without any poo or wee emergency exits? …’til I try the beer! 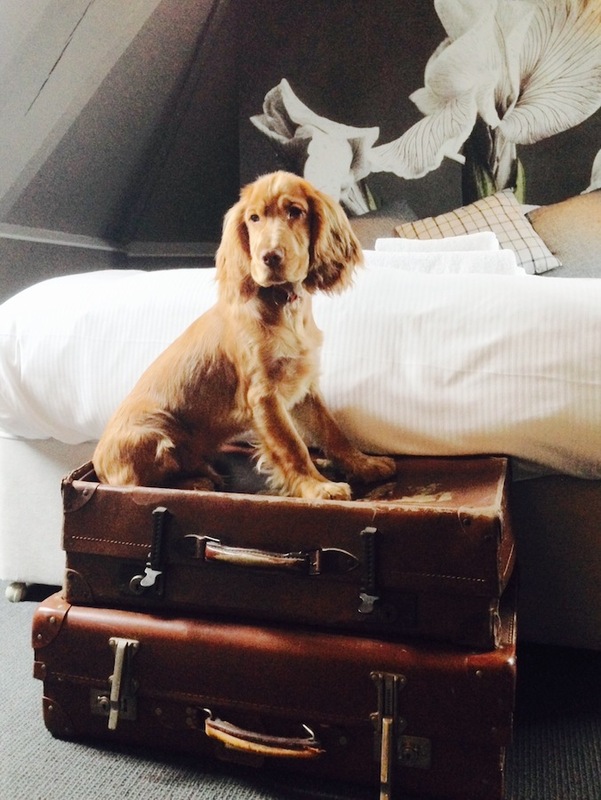 Turns out I needn’t have had any such apprehension about staying at The King’s Arms in Didmarton, Gloucestershire with our lively four-month-old Cocker Spaniel Barney. As soon as we walked into the bar of the stone-flagged Inn, I knew we were in doggy-accepted heaven. First, a couple of jars of help-yourself bone-shaped doggy biscuits to welcome all canine visitors. Then a bottle of Snuffle Dog Beer at the bar (a zero alcohol mix of beef or chicken and malt barley extracts) to bond over while you enjoy a pint. And next, a resident Jack Russell dog called Spoof whose basket was tucked in cosily at the side of a roaring fire and who was happy to indulge his puppy guest in some rough and tumble. We were in doggy (and owner) heaven alright. Relaxed? All of us; within minutes. The Kings Arms – originally a 17th century coaching inn and now a Grade II listed pub, lies in the middle of the Gloucestershire countryside, so is perfectly placed for plenty of fresh-air walking but it’s also a short drive from Bath, Bristol and Cheltenham if you want some culture or the chance to catch up on some shopping. And if you like browsing antique shops, then take a detour to nearby market town Tetbury which has a treasure trove of them. There are six rooms in the pub but we stayed in Saracen, one of two cottages in the gardens which were originally the stables of the inn. A large wooden-beamed three-bedroomed cottage on two floors, it’s completely self-contained and if you do have a barky dog, then you won’t be disturbing anyone if he does decide to yelp in strange surroundings. 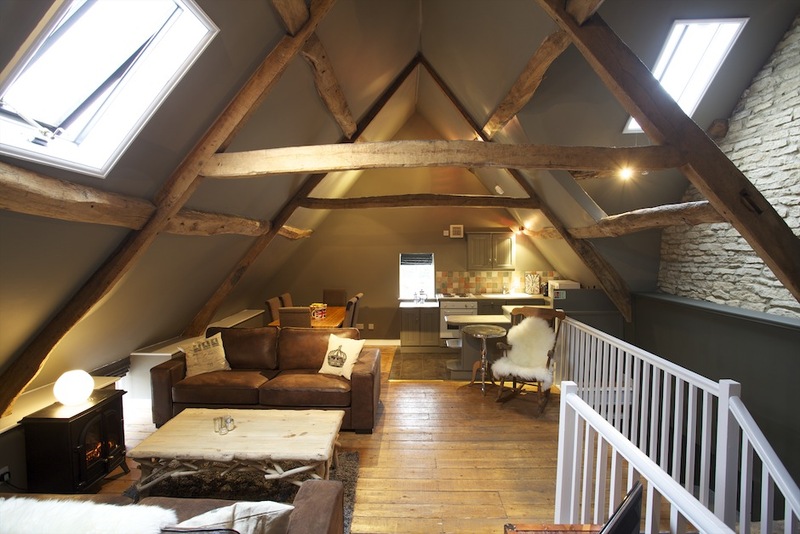 There were two double rooms with king-size beds, a twin room plus a large open-plan sitting room with brown leather sofas adorned with sheepskin throws, a dining area and kitchen. Floors were wooden and the walls were dramatically painted in a dark grey with a striking floral feature wall in the main bedroom. And a bed had been left for Barney in the living room too. not sure I can sleep in strange surroundings…. Alistair, our two boys and I (with Barney ensconced at our feet on a blanket) enjoyed a relaxed evening meal in the bar dining area. The menu focuses on seasonal British dishes, with ingredients sourced from local estates and farms. Highlights included Home Hot Smoked Salmon and a Roast beetroot salad with Cerney goat’s cheese. The Badminton Estate is just a few hundred yards away, so we all enjoyed a walk there – and there’s an outside tap at the inn to wash down dirty paws when you get back. There’s also a pleasant beer garden when the weather’s nice. 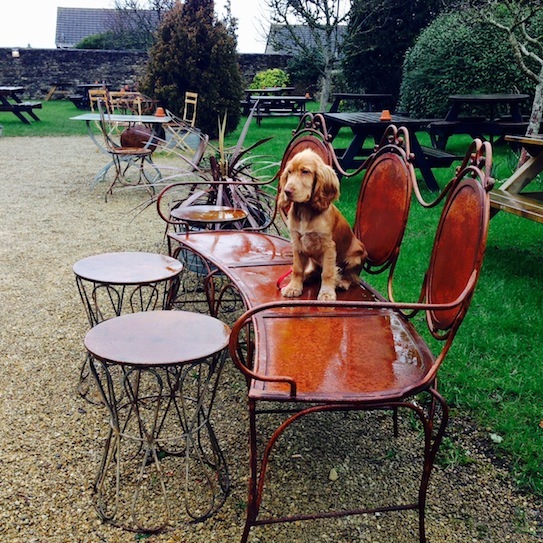 If you’re looking for a cosy country retreat with a warm welcome, good food and somewhere your dog is treated as a wanted guest, then you can’t go wrong at The King’s Arms.